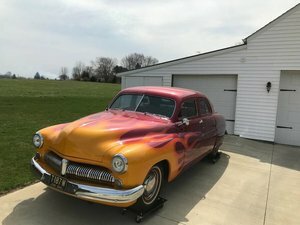 When it came to getting America’s middle-class motoring public back on the roads after World War II, Mercury was there, like every other automaker, ready to sell vehicles that differed little from their pre-war counterparts. MotoeXotica is pleased to present this 1947 Mercury Eight Club Convertible which was the recipient of a comprehensive restoration. We are selling this awesome local Mercury to settle the estate of their father, which was his cherished possession. He carefully documented the whole restoration process over several years with over 200 detailed photos. Dressed in Pheasant Red, this car’s paint is in overall great condition, though the trim shows some minor dings upon close inspection. The windows are clear and crack-free while the car’s lights look great, including the dual spotlights and the amber fog lights perched atop the front bumper – haze-free and intact. The bodywork, including the rear fender skirts, is overall straight and solid, the car’s engine bay is tidy and the battery looks good. The chrome bumpers fit well to the body and is a very nice older restoration that presents itself extremely well today. This Merc rides on Firestone Gum-Dipped wide whitewall tires, size 6.70-15 at all four corners. Each tire surrounds a steel wheel with factory wheel covers and beauty rings. The wheels and tires are in overall great condition with minimal blemishes. Under that vee’d hood is Ford’s 239 CID Flathead V-8 engine with a two-barrel carburetor and breathing through dual exhausts which was reportedly rebuilt during the extensive restoration process. New engine innovations for 1947 included a moisture-sealed distributor and oil-resistant electrical wiring. The engine is buttoned to a three-speed manual transmission and a 3.54 rear end. Inside, the tan interior looks beautiful. The seats are in excellent overall condition while the matching carpet is in great shape. The original two-spoke steering wheel looks good, as do the inner door panels and instrument panel, with its full complement of gauges. Completing this time capsule is a factory AM radio. Styling changes were slight in 1947. The Mercury name was placed on the side of the hood. Different hubcaps were used. The border around the grille was chrome plated. The “Eight” script still ran down its center. There was also new trunk trim. More chrome was used on the interior and the dash dial faces were redesigned. The convertible and station wagon came with leather upholstery. The other body styles used fabric. The wood paneled Sportsman convertible was gone. Competition to this Mercury in 1947 included Buick’s Series 50 Super Convertible, DeSoto’s Custom Convertible Club Coupe, Oldsmobile’s 68 Special Convertible and Pontiac’s Torpedo Convertible. Ford collectors, convertible aficionados or those who seek a rolling conversation piece should not hesitate to visit MotoeXotica Classic Cars and take a gander at this beauty. This car is currently located at our facility in St. Louis, Missouri. Current mileage on the odometer shows 130 miles. It is sold as is, where is, on a clean and clear, mileage exempt title. GET OUT AND DRIVE!!! PLEASE CLICK HERE T VIEW OUR YOUTUBE VIDEO!!! !